The occupant classification system circuit consists of the center airbag sensor assembly and occupant classification system. If the center airbag sensor assembly receives signals from the occupant classification ECU, it determines whether the front passenger airbag and front seat belt pretensioner RH should be operated. DTC B1650/32 is stored when a malfunction is detected in the occupant classification system circuit. The center airbag sensor assembly receives a line short circuit signal, an open circuit signal, a short circuit to ground signal or a short circuit to B+ signal in the occupant classification system circuit. 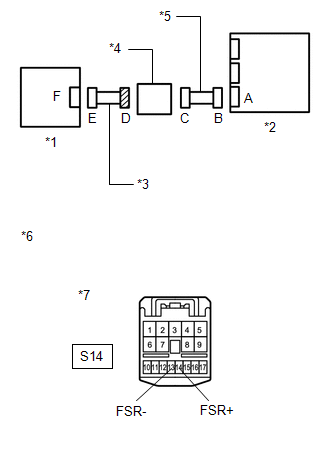 (b) Using the Techstream, check for DTCs of the occupant classification ECU (See page ). Check that the connectors are properly connected to the center airbag sensor assembly and occupant classification ECU. Also check that the connectors that link the front seat wire RH, junction connector and No. 2 floor wire are properly connected. Check that the connectors are properly connected to the center airbag sensor assembly and occupant classification ECU. Disconnect the connectors from the center airbag sensor assembly and occupant classification ECU. Also disconnect the connectors that link the front seat wire RH, junction connector and No. 2 floor wire. Disconnect the connectors from the center airbag sensor assembly and occupant classification ECU. (g) Check that the connector terminals are not damaged. (a) Check the passenger seat type. 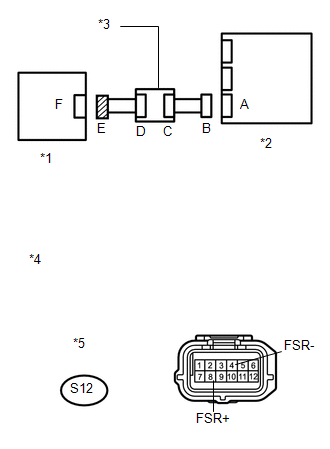 (a) Using SST, connect terminals 16 (FSR+) and 24 (FSR-) of connector B. 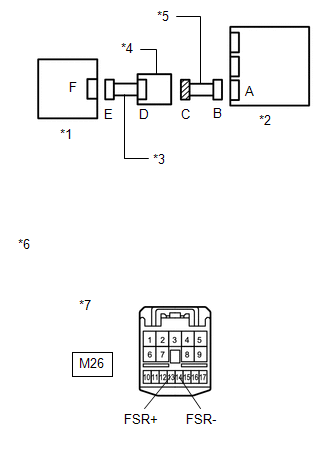 (a) Disconnect SST from connector B. (c) Measure the voltage according to the value (s) in the table below. After replacing the center airbag sensor assembly, check for DTCs of the center airbag sensor assembly. If DTC B1650/32 is detected, replace the occupant classification ECU (See page ) and perform "zero point calibration"
and "sensitivity check" of the occupant classification system (See page ). (a) Connect the connectors that link the front seat wire RH, junction connector and No. 2 floor wire. 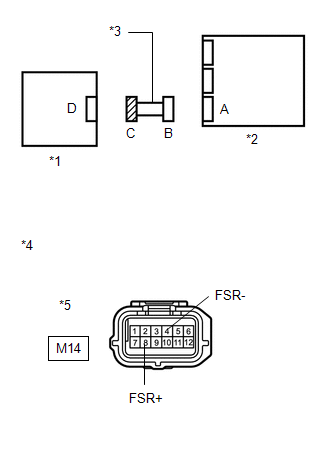 (b) Using SST, connect terminals 16 (FSR+) and 24 (FSR-) of connector B. (a) Disconnect the junction connector from the No. 2 floor wire. SST already been inserted into connector B. 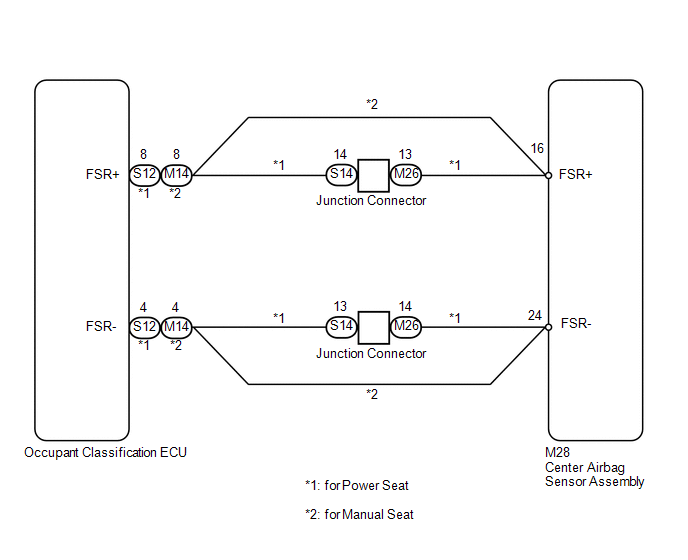 (a) Disconnect the front seat wire RH connector from the junction connector. (b) Using SST, connect terminals 8 (FSR+) and 4 (FSR-) of connector E.
Do not forcibly insert SST into the terminals of the connector when connecting the wire. (c) Disconnect the junction connector from the No. 2 floor wire. (f) Measure the voltage according to the value(s) in the table below. (c) Disconnect the front seat wire RH connector from the junction connector.